Here's a question from a reader and I thought I might as well answer it on a separate page. I will be building a deck in a few weeks and was wondering about how to double up the outside joist (additional support if I enclose the deck later). 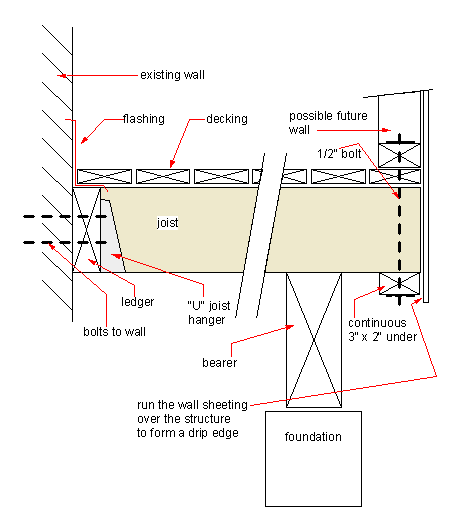 Would I put in the first joist with a joist hanger (to the ledger)and then install the outside joist and nail it into the side of the ledger-- or put both joist to the outside of the ledger and nail them both into the side of the ledger? Doing this is a bit of a tradition here in Australia. The old Queensland style timber houses were built with wide covered verandas (decks) all around, for shade and outdoor living. As the family grew and extra bedrooms were needed it was common to build in a section of the verandah. Three walls, a door and a window created an extra room cheaply. This is just a general guide, I can't try to guess what your particular building regulations are etc. If I was chatting face to face with you I would be reaching for a pencil and doing a few sketches to try and explain what I am saying. First off Keith, without going into details, I would say build your deck normally, just single joists. Fix the boards and use the deck. If and when you want to wall a section in, just fix the walls to the top of the deck. Here is my thinking behind this. A years ago when I first started working on timber frame houses we had to lay the floor joists out something like this. 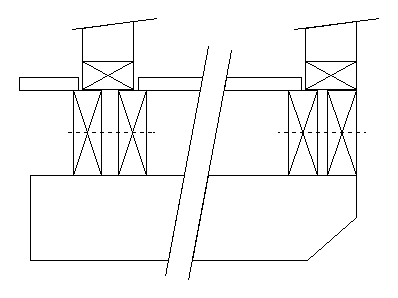 Decking - Sketch of the joist layout for an elevated house, with the flooring fixed after the walls and roof were completed. The double joist at the edge was just as much about giving us something to fix the floor boards to, as to add extra strength. They had a packer between them and were bolted together say every 3ft. Where we had a wall running across the joists there was no problem, but where the wall ran the same way as the joists we had to put in at least one extra joist and change the spacings to suit the wall position. Decking - Sitting the new walls directly onto the existing floor. So if I were you Keith I would not bother with double joists, unless you are maybe spanning a bit more than you should, in which case double up and bolt them, not nails. I say this because bolt fixing is a lot more positive. Here's a tip for double joists. The conventional wisdom is to fix your joists with the bow up, so that after time they will tend to go straighter. You don't really want a badly bowed joist that you will be fixing a wall on to later, so you could be getting your buzzer out to straighten it. Try this instead. Put your two joists one bow up and one bow down. Work from one end, bolting and cramping them level, and you will finish up with a double joist that is straighter than either of the two that made it. then buzz oft the double joist if you have to. 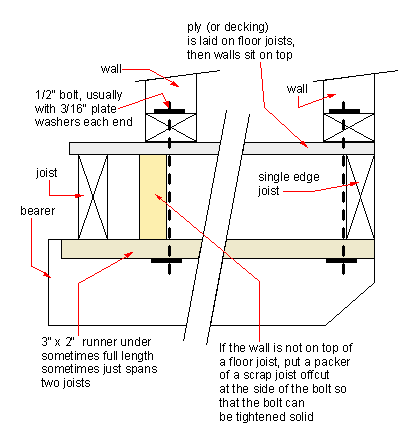 Decking - Fixing the inboard end of the deck to a masonry wall. Here is a section through the deck with the ends of the joists fixed to a ledger on the wall. I have drawn the ledger bolted to a masonry wall. Personally I would not be real happy fixing like this. That interface between the deck and the wall is the first place for moisture to lurk and so for rot to take hold. I like leaving the original house intact, and making the deck freestanding. I have seen quite a few decks where the deck joists were bolted to the house joists. They had rotted at the join. The repair of the deck is easy, but repairing joists under the house is a different ball game. The "U" shaped joist hangers are great, an easy and good fixing. I have shown a metal flashing (red) to try to protect the ledger. Don't nail the end board through it. In masonry walls I always detail a saw cut,(could be a raked out joint) with the flashing turned into it, say 1/2". It makes a straight edge to the flashing and if sealed properly will last for years. Go To Top :Decking question. Other Deck patio ideas related Pages. deck patio ideasAn example high level deck with a roof. Patio deck designs A low level deck with a roof and built in seating. I once built a really nice high level roofed deck to a house, that made a really large area leading out from the existing living room. Tagged onto the end, around a corner the owner, Ian, wanted a small area that seemed to me to be a waste of time and effort. Nevertheless I put it on the plans and we built it. When the whole thing was finished and approved, Ian came back to me with an extra, we built three lightweight fly wire screen walls and hey presto! He had a perfect open air guest bedroom. We sealed the gaps between the decking boards with Sikaflex LM sealer, taking care and masking off every joint so that there were no smears on the boards. It looked just like the deck of a ship. I can image that little room to be the coolest non air-conditioned bedroom in the neighbourhood.